Henry and Emma Carlson - 1942. 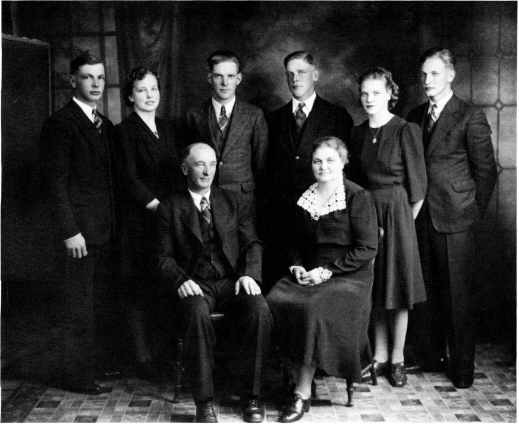 Walter, Harriet, Ernest, Gordon, Emma and Robert. until his death in 1966. He was always a man content within his own home, but served on the Tales School board for 20 years, being the secretary-treasurer most of that time. Emma, who had come from Sweden as a child of ten (see Hall-Erik and Elisabet) had only a few weeks in school in Canada, and not very productive ones as she knew no English. Until her marriage, she worked out as a housemaid when she could be spared from home, one of the more interesting positions being a year with the Stephen Clement family in Brandon. She spent a con­ siderable part of her youth cooking for the gangs in her father's sawmill, a demanding task for a young girl. She was a true helpmate in her new home, exercising many skills to make ends meet where it often took considerable stretching to make that possible. All six children were born at home, only the youngest with a doctor in at­ tendance. The first home had one room downstairs and one up.